LOVELY TOWNHOUSE with PRIVATE SKI-HOME TRAIL! SLEEPS 5-6! 2 bedrooms, 2 full/1 half baths, loft sleeping area, sleeps 5-6! Bears Crossing is a well- maintained community located a mile from the Carinthia side of Mt. Snow. The beautiful outdoor community pool is open Memorial Day until Labor Day, the clubhouse and tennis court are open all year and are for all our guests to enjoy! The ski-home trail on Brumms Way offers you a challenging hike to the summit of Mt. Snow or a private, Mt. Snow maintained ski-home trail right to your front door in the winter! During winter weekends and holiday weeks, the free Moover shuttle bus runs to and from the mountain from 7:30am until 5pm. The Grand Summit Hotel has top-quality spa treatments available to the public and the Valley Trail is nearby for a 45 minute walk to downtown West Dover, with its wonderful shopping and restaurants. The Manchester shopping outlet is a lovely 30 minute drive away and the quaint historic town of Wilmington is 10 minutes away. Come, relax and have some fun in our fresh country air! toilet, This small bathroom sits right off the 2nd floor kitchen. The Grand Summit Resort is only 3 miles from the townhouse and offers many public amenities. Two vehicles are allowed in front of the townhouse and overflow parking is close by. During peak holidays, the wifi works but it is quite slow due to high volume usage in the Mt. Snow area. Located at the Clubhouse on Polar Bear South off Bears Den Road. We do have wifi but during peak holiday times, it is very slow in all the Mt. Snow area. Large wraparound sofa bed, coffee table, shelves with books, magazines, games and movies, large flatscreen TV and DVR. This is a well-equipped kitchen and has seating for 6-8. In the clubhouse on Polar Bear South. There is a pool table, ping-pong table, fitness area, bathroom, lounge area with large flat-screen TV and cozy seating, wifi and many books for guests to enjoy! Located in the Clubhouse on Polar Bear South off Bears Den Road. Can be rented from Equipe Sports across from the Sundance Base Lodge at Mt.Snow, about two miles away. Boats can be rented from High Country Marina on Harriman Reservoir less than 15 minutes away. Off the second story living room. Can be rented from Equipe Sports across from the Sundance Base Lodge at Mt. Snow, about two miles away. Can be rented at the base lodge at Mt. Snow, as well as independent dealers along Route 100. Located behind the Clubhouse on Polar Bear South off Bears Den Road. At nearby Mt. Snow Golf Course. Open from Memorial Day until Labor Day and located next to Clubhouse on Polar Bear South off Bears Den Road. The free Moover shuttle bus runs through Bears Crossing every half hour from 7:30am until 5pm winter weekends and winter holidays only until 3/24/19. We also have a concierge service to make your vacation stress-free! Karen’s place is very cozy. Access to the MOOver bus is very convenient and the ability to ski back to the townhouse is a plus! We had a parking question for Karen and she answered immediately. This house was a great place to stay for our ski weekend to Mt. Snow. It was clean and warm, plenty of sleeping spaces for everyone, and the fireplace with provided wood was a great bonus. Close to the mountain so very convenient, and the rustic ambience was very cozy. it was great working with Karen, everything was very smooth logistically. Hi, Madeleine. Thanks for the review of your stay at our townhouse. I am so happy your enjoyed your accommodations and that you and your friends were comfortable. Please keep us in mind for another visit to Mt. Snow. Happy Winter! 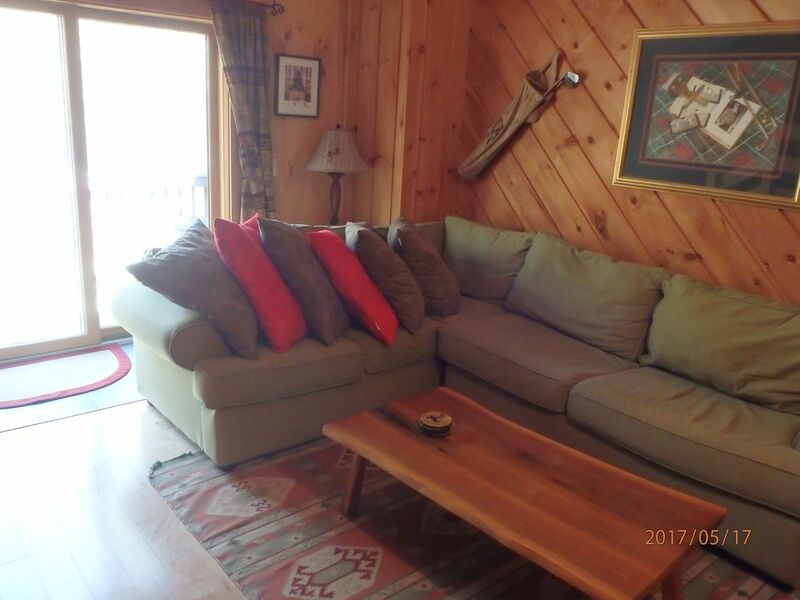 The unit was clean and comfortable; location is convenient to the mountain. Karen is very responsive in the limited times we touched base on logistics. Overall I would recommend this property. Beautiful lakes, walking and hiking trails,skiing, snowboarding, snowmobiling, snowshoeing, restaurants, outlet shopping, quaint New England villages, cinema, groceries, antiquing, flea market from May to October, arts, winery and spa services nearby. Three story townhouse is charming and just remodeled! Quiet and comfortable with full kitchen, housekeeping services for a minimum fee, linens provided, full use of recreation center featuring billiard table, ping-pong table, exercise equipment, large flat screen TV, seating area, bathroom, outdoor pool (in season), ski-in trail (in season) and lovely landscaping. Ski: Mt. Snow, Stratton, Bromley, Okemo, Please call me directly to discuss a reservation, 973-769-4628! Please do not rely solely on e-mails.